A performance filled with acrobatics, pranks, jokes, tricks and magic! A circus-variety-cabaret or whatever you wish to call it. 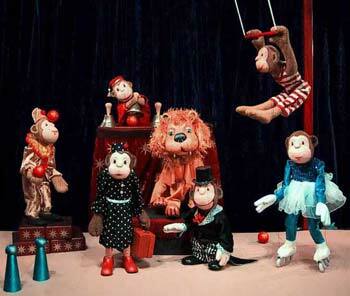 Marionettes, hand puppets and table puppets have great similarities with monkeys and they perform the most amazing feats. Two circus directors run the show and they don't always agree. And as monkeys do, these monkeys soon suss the scene. A look into the workshop! Suitable for: 2-8 yearolds, or all ages family performance. Many thanks to Juan Rodriguez dramaturgy advices.